A full interior and exterior treatment consists of a visual inspection of “hot spot” areas, treatment of cracks and crevices, wall voids, attics, crawl spaces, window and door frames, baseboards, electrical outlets, pipe chases, decking, tree bases and stumps, and perimeter of the structure. Suggestions will also be made for control measures such as removing overhanging tree limbs, dead tree stumps, sealing gaps and cracks, etc. Treatment can either be a combination of chemical/residual/ULV or bait and dust. Both are equally effective, but bait and dust generally are a little slower to take effect. 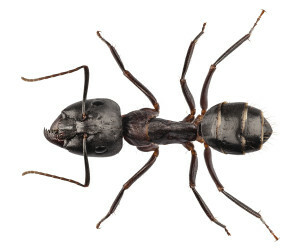 A bait and dust carpenter ant treatment requires a minimum of 4 visits, 2 weeks apart from our licensed pest control technicians. If the colony has not been eradicated at the time of treatment, generally within 2 weeks they should be dead. The treatment is fully warrantied for the season, therefore, if after 2 weeks following treatment there are still signs of ant activity, we will return to repeat the procedure to specific areas or all areas, if necessary. We recommend all occupants, including pets, vacate the premises for a minimum of 4 hours. Children under 1 year and pregnant women, we recommend 24 hours. Each year after the initial treatment, Miller Pest Control highly recommends having an exterior preventive treatment. This treatment will help reduce the risk of re-infestation on the interior of the structure and re-guarantees the original interior work.